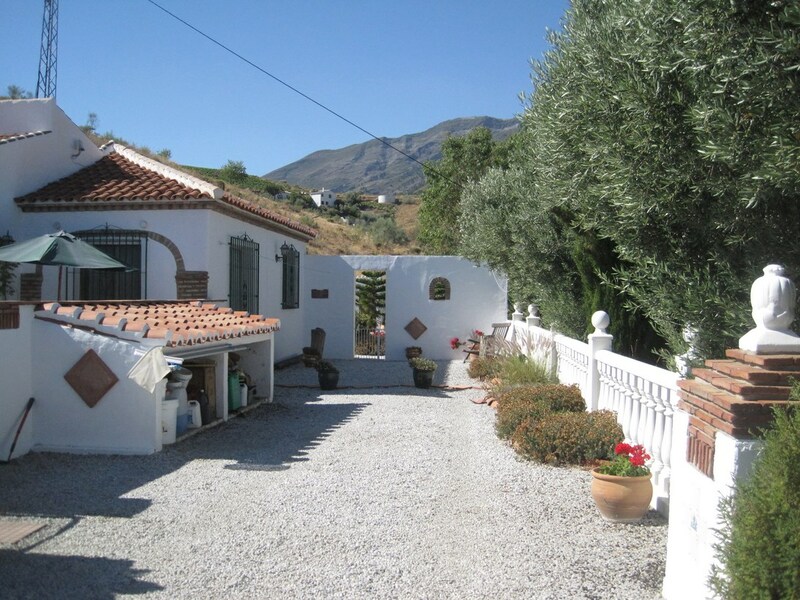 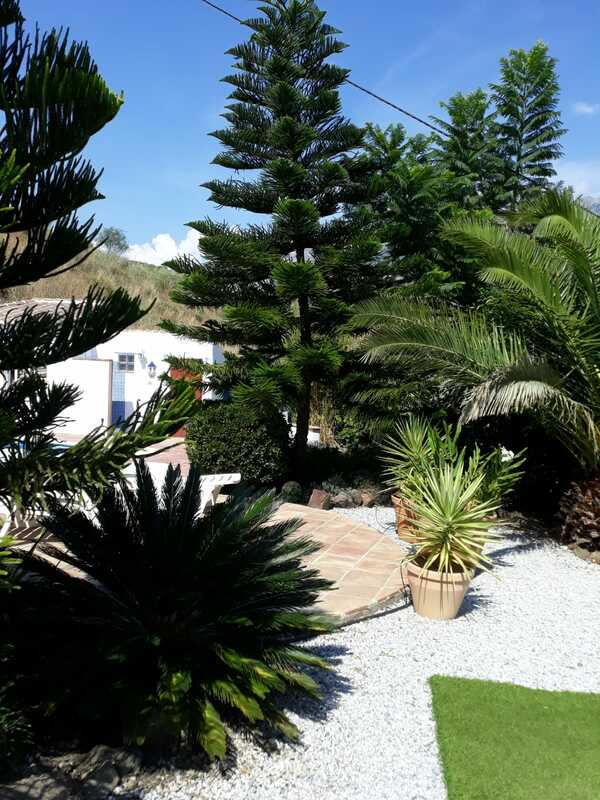 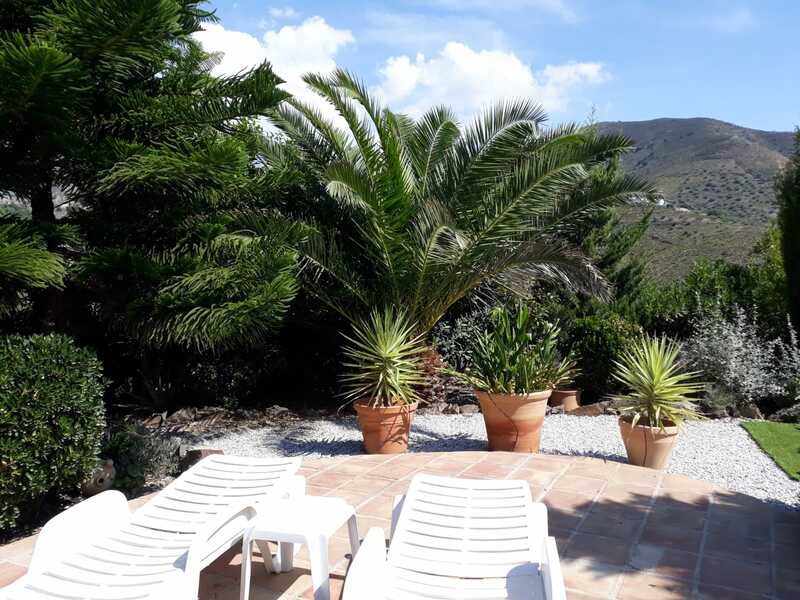 Finca Mulo de Arriba is located along a dirt track around 2.5 Kms from the mountain village of Canillas de Aceituno (only 500m to the main track, which is in the planning for concreting, date not yet known). 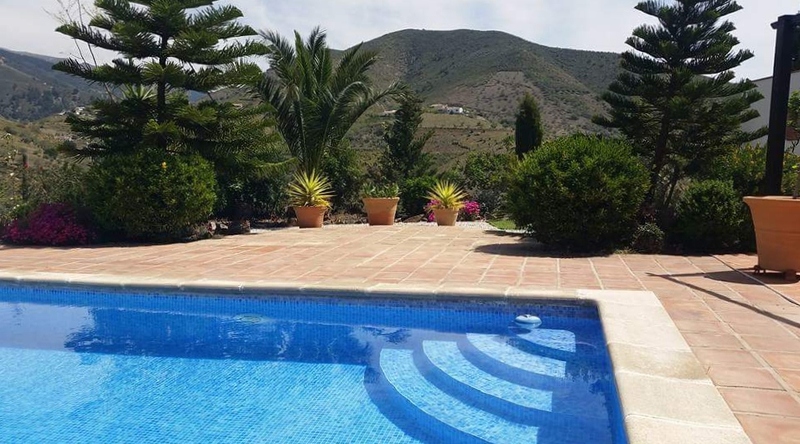 There are other houses not too far away, so it is not too isolated, but it is totally private and not overlooked and the nearest houses are at a good distance. 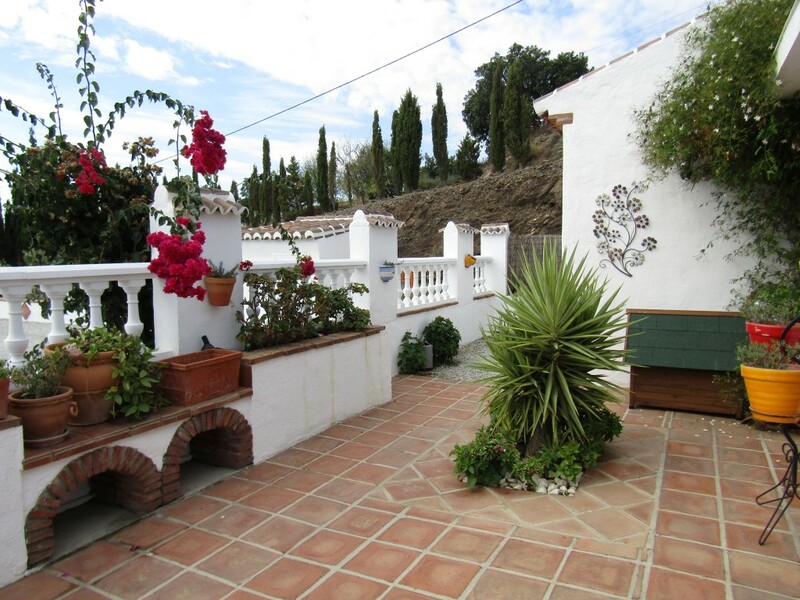 It has a fenced and gated garden and further land below, sloping down the hill. 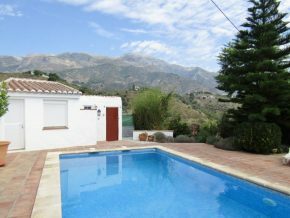 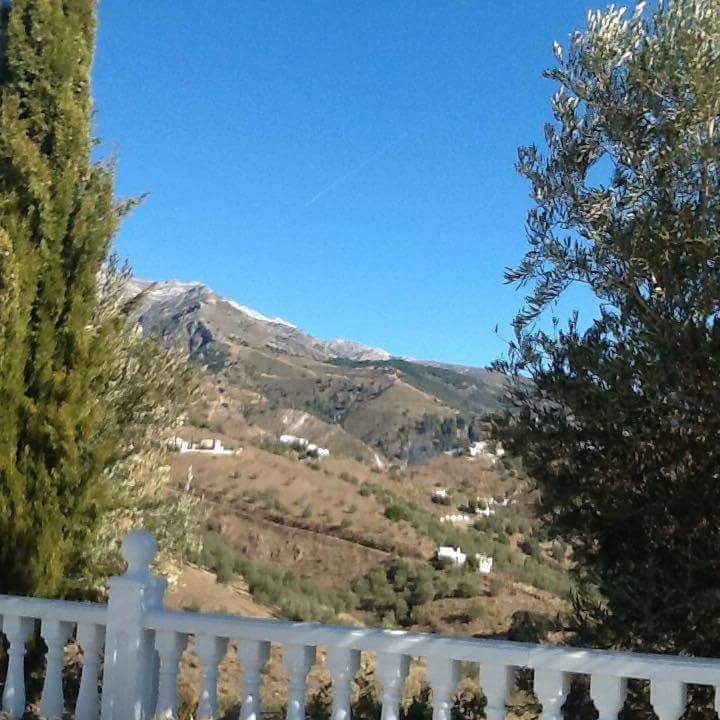 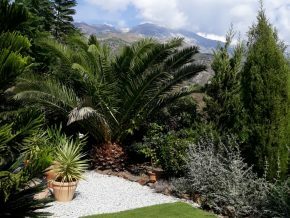 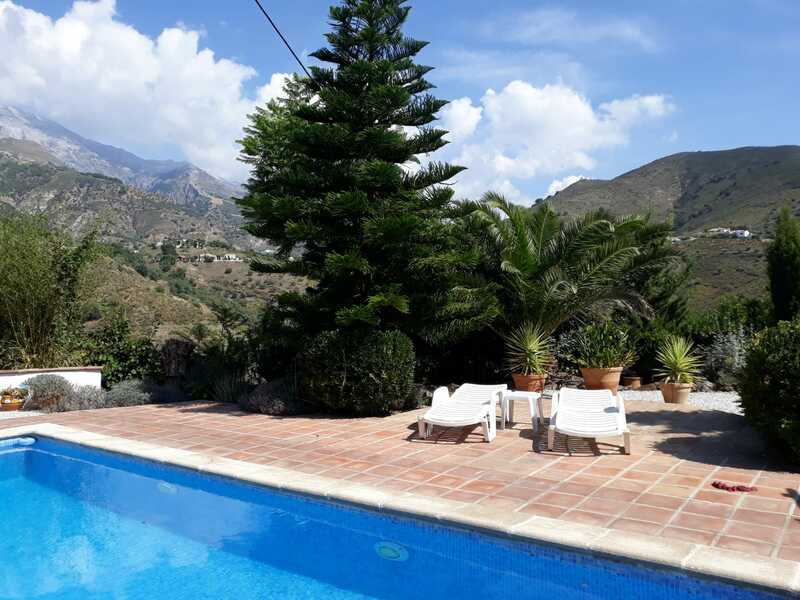 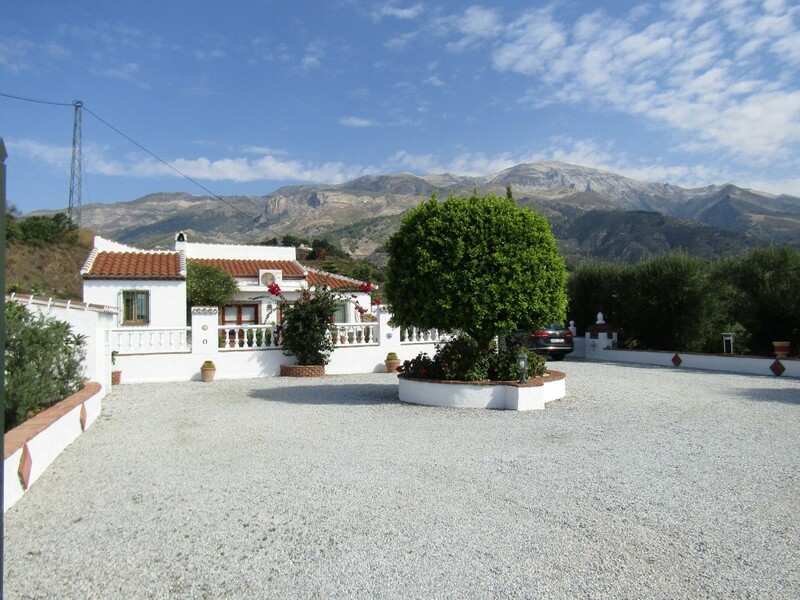 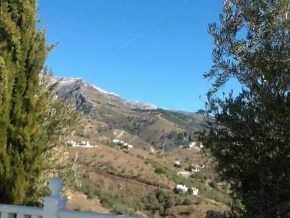 There are lovely views all around, and most particularly on the spectacular mountain peak of La Maroma, the highest in Malaga province. 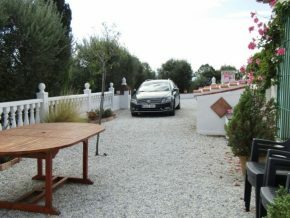 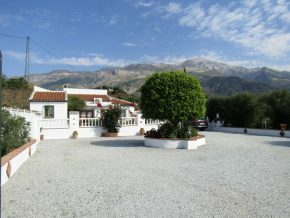 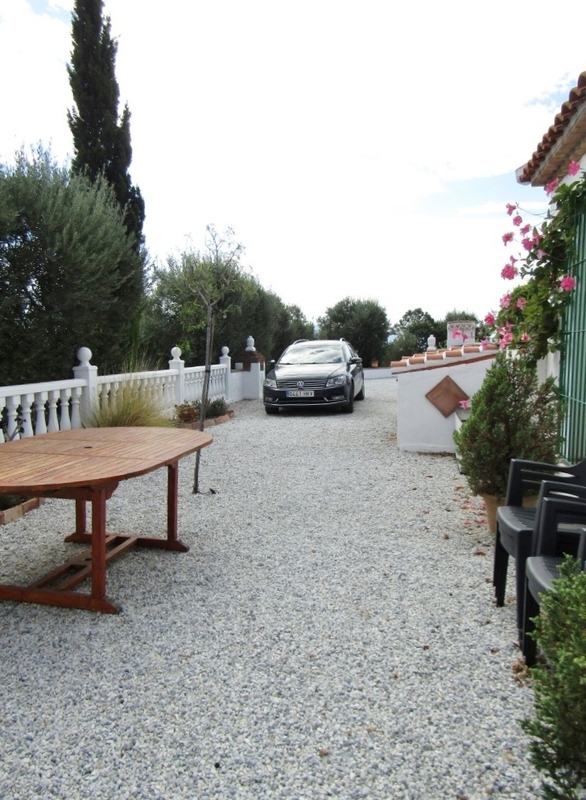 The property has a very spacious graveled car parking area and easy turning-circle. 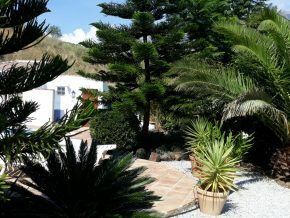 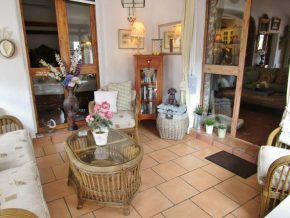 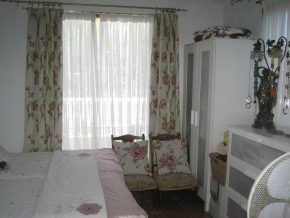 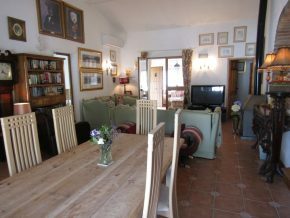 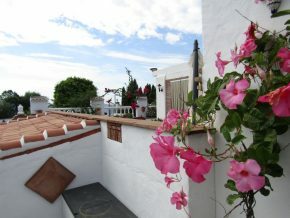 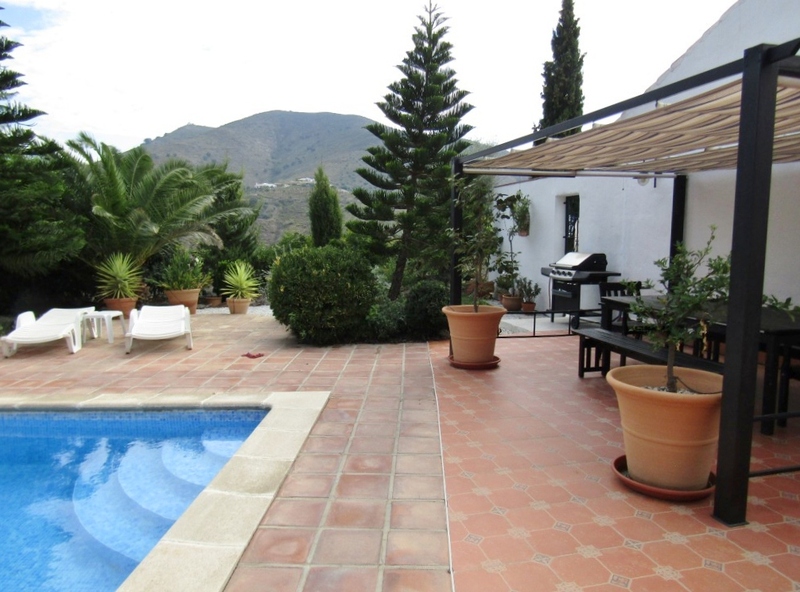 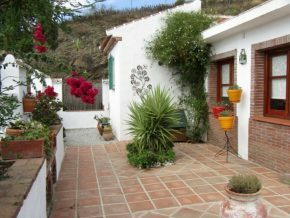 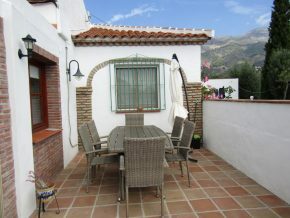 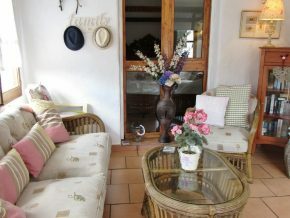 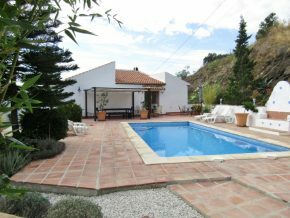 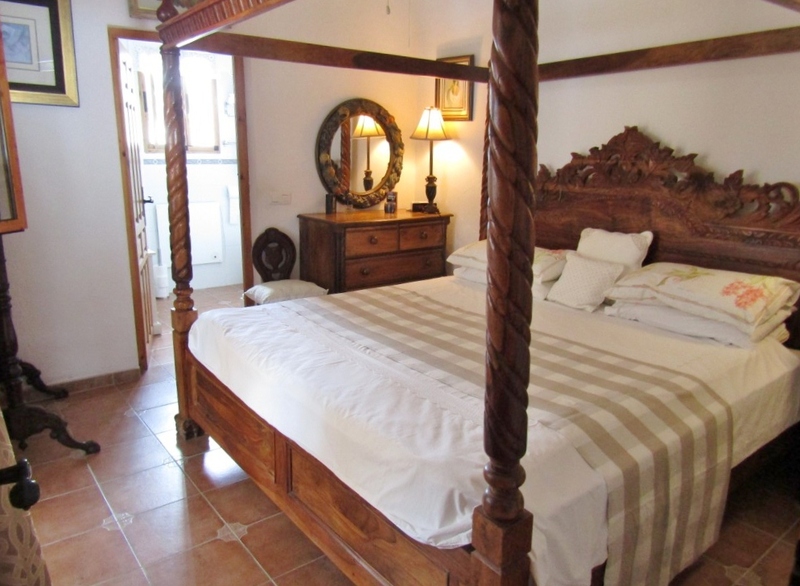 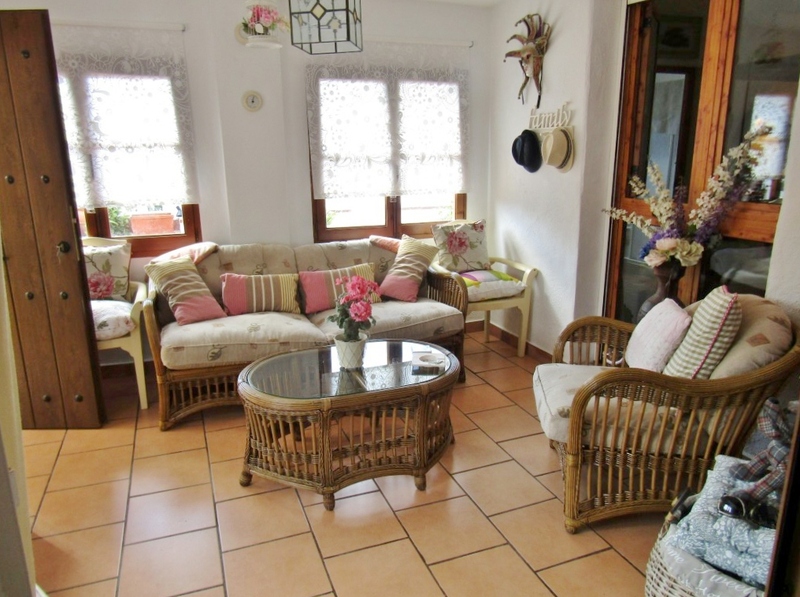 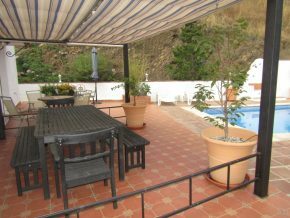 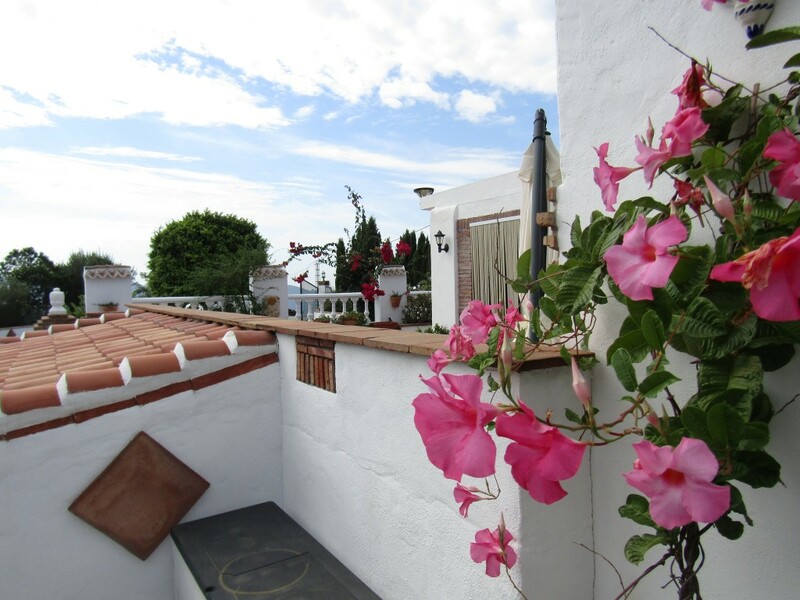 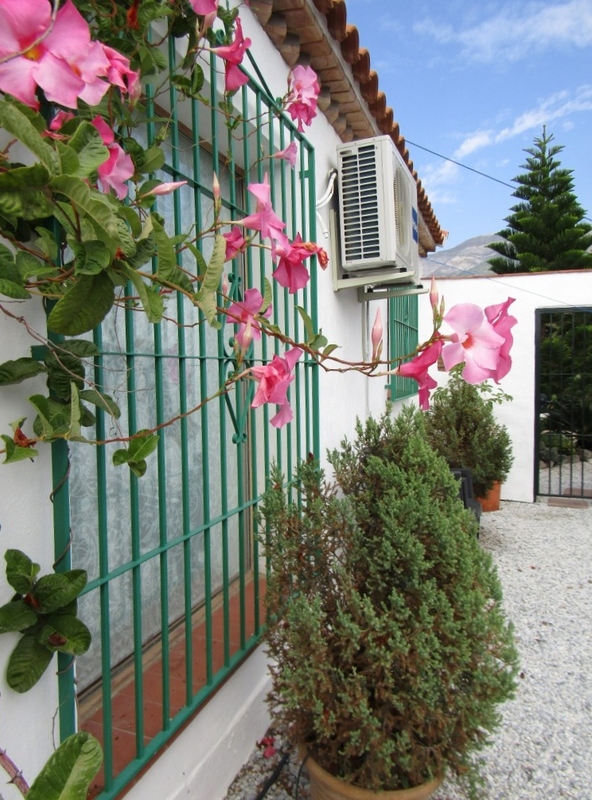 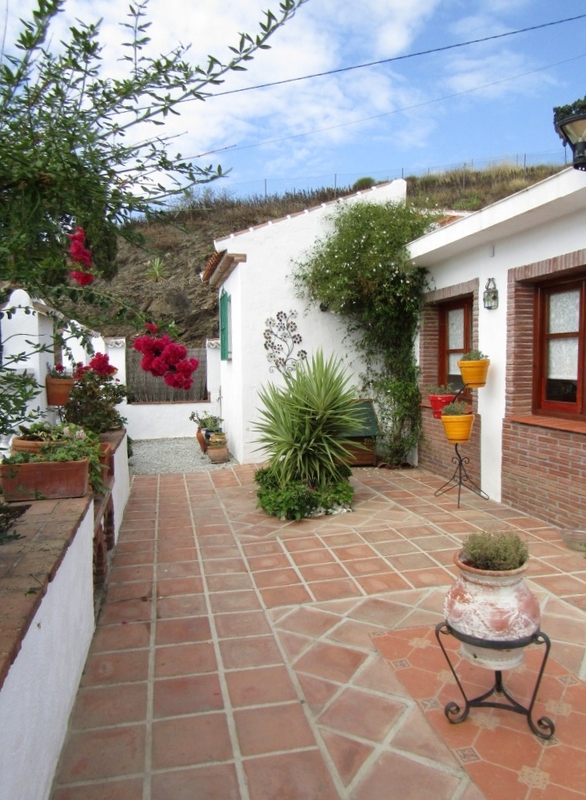 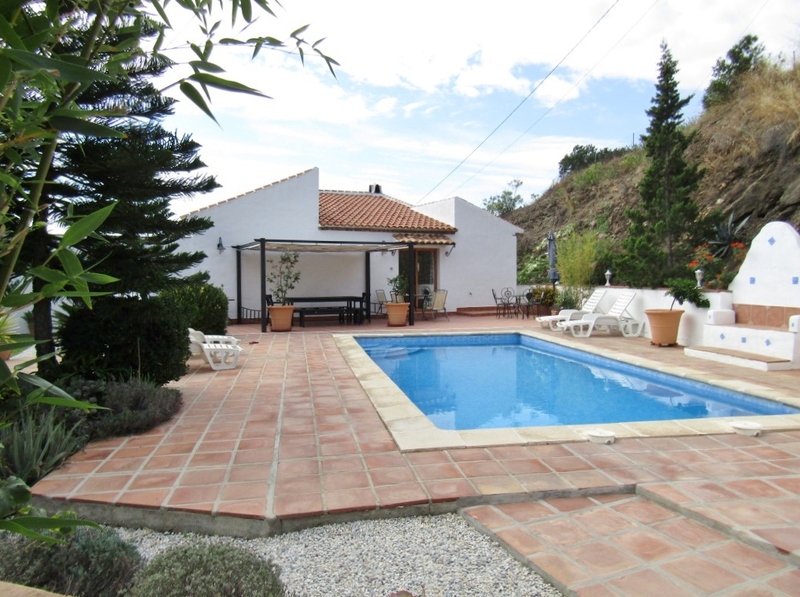 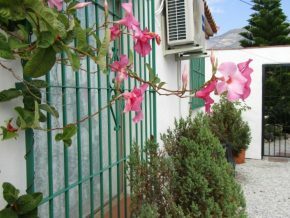 Beyond, a lovely Andalusian patio full of potted flowering plants, and a ‘Winter Room’, ideal for the Winter months. 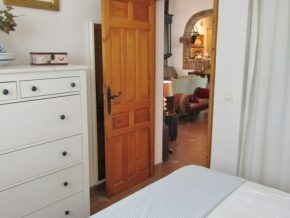 From the Winter room, a door takes you into the living room (a spacious 8 x 5.5m) with woodburning fireplace, and with an open arch on one side leading into the open plan kitchen (4 x 2.25m) and utility room beyond (2 x 1.5m). 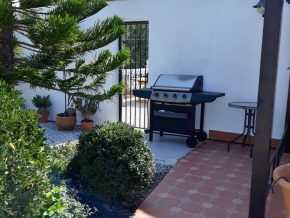 There are three bedrooms leading from different doors around the central living area, all double rooms, approximate sizes being 3 x 3.25m, 3 x 4m with dual aspect windows, and 3 x 4m plus built-in wardrobe and double sliding patio doors to the garden and an ensuite bathroom (2 x 2.25m). 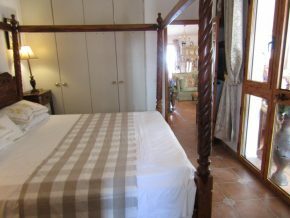 One of the bedrooms has a unique built-in bunk-bed unit, set within one of the walls – great for young children, or useful storage space. 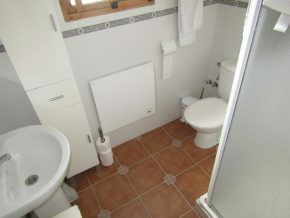 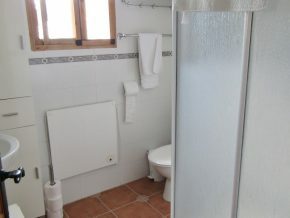 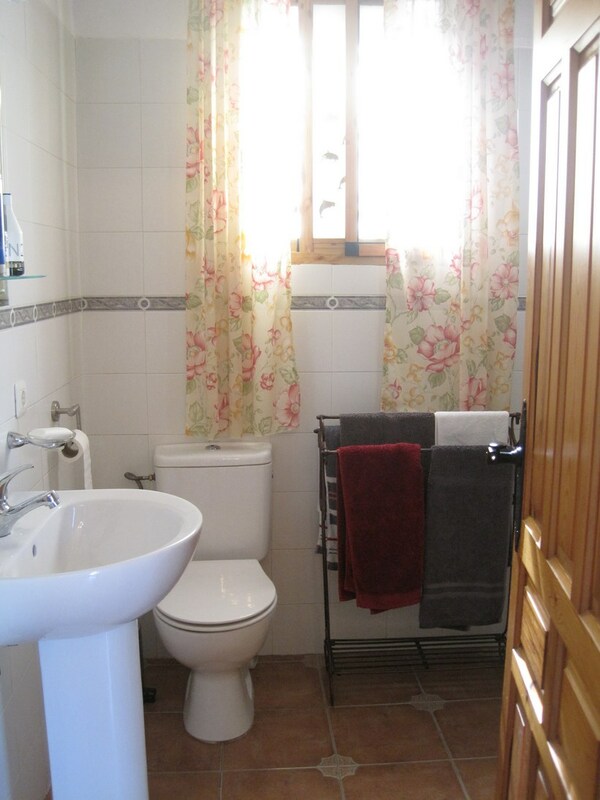 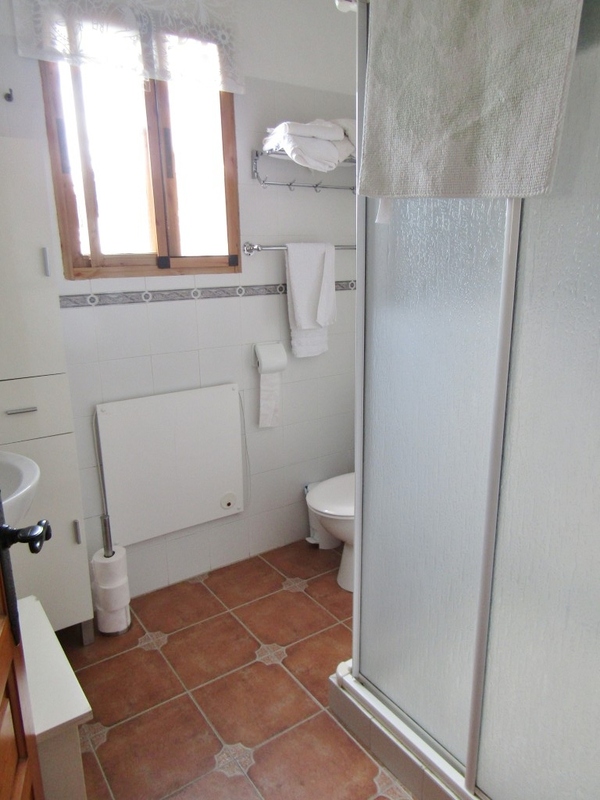 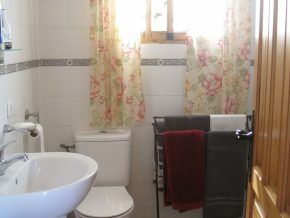 There is also a family bathroom (2 x 2m). 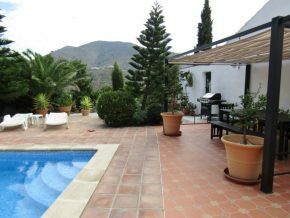 Double sliding glass patio doors from the living room lead to the rear garden, dining, barbeque and pool terrace, with beautiful mountain views. 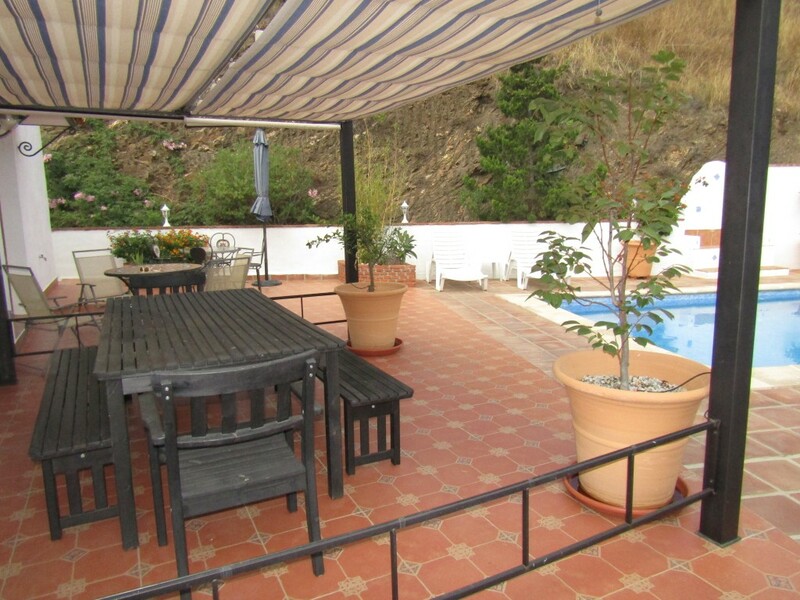 The pool (8 x 4m) is located centrally and there is a small store room beyond. 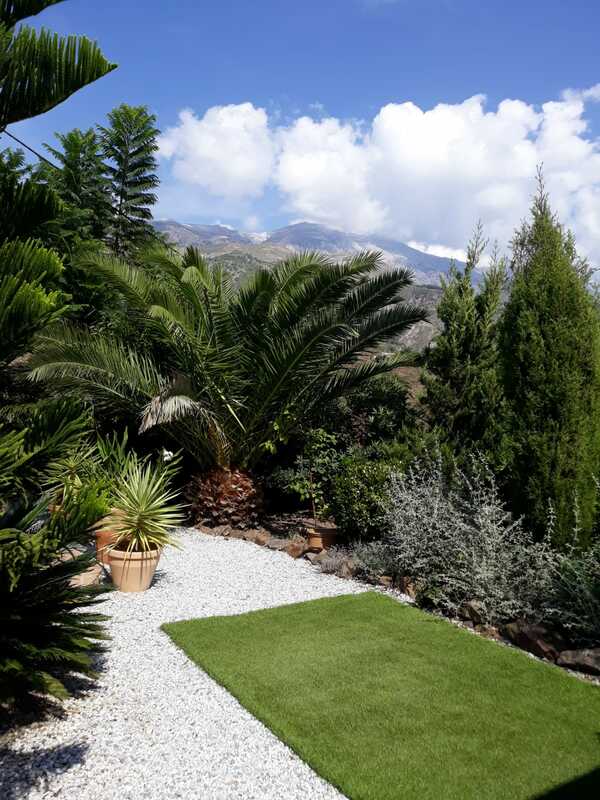 The rest of the land is beyond the fenced garden, and although fairly steep, with a little bit of earth movement, it could be made useable for planting fruit trees, vegetables, etc. 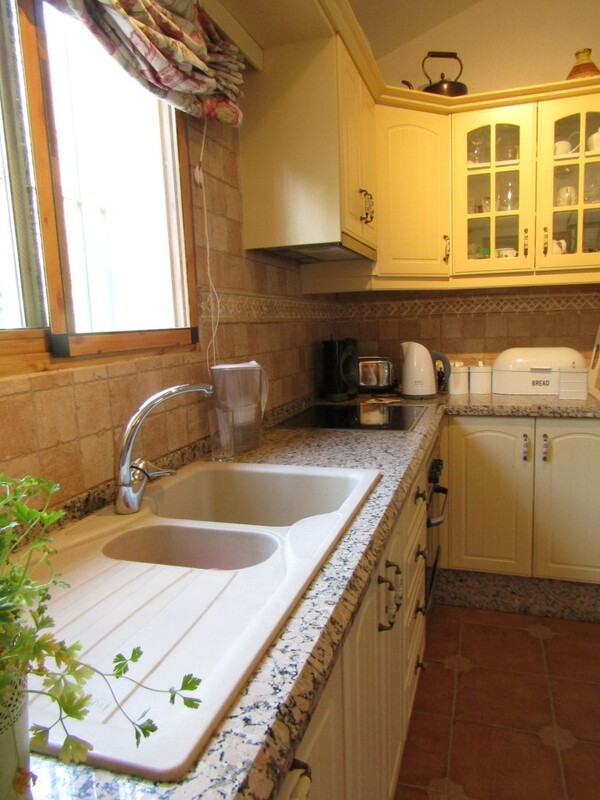 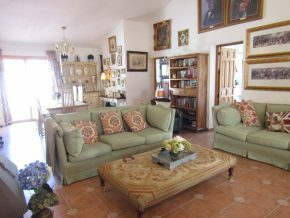 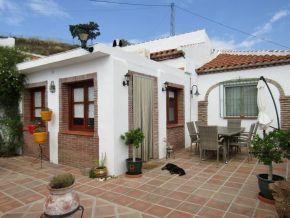 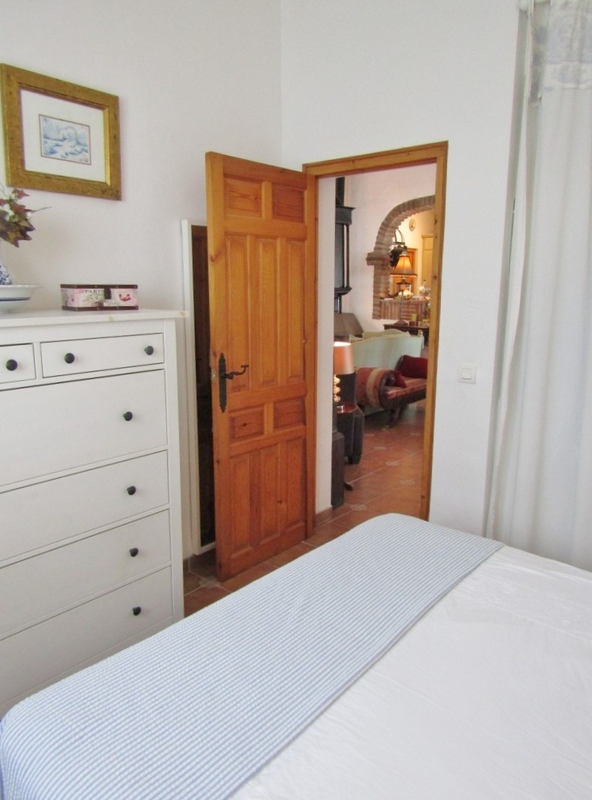 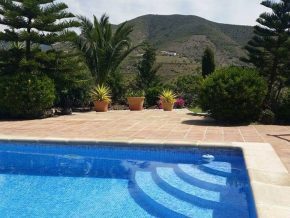 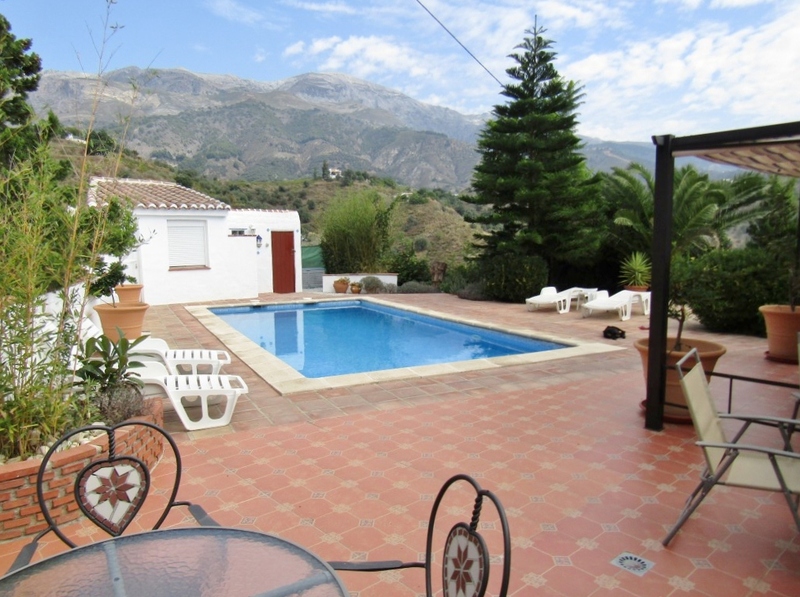 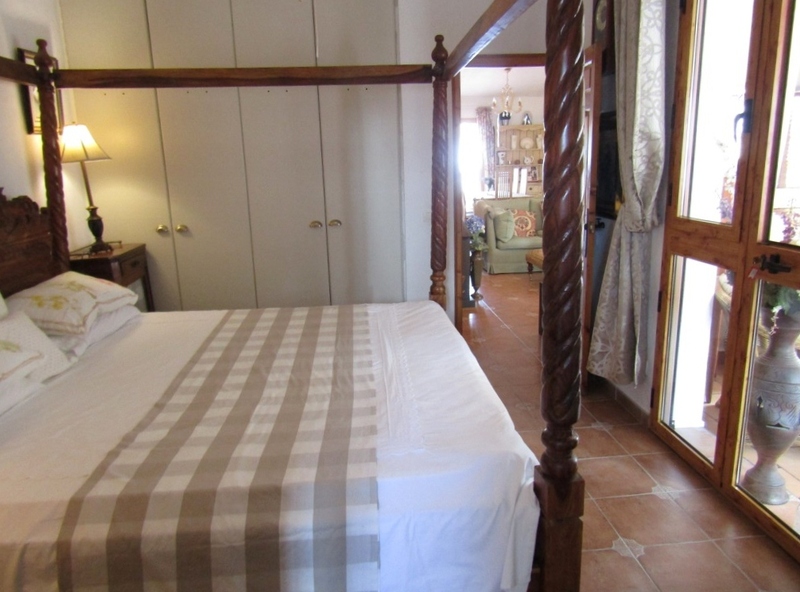 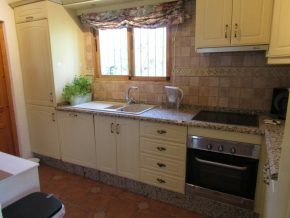 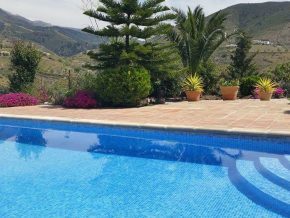 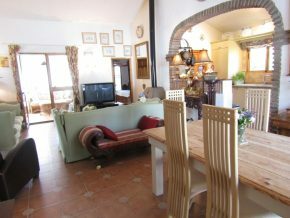 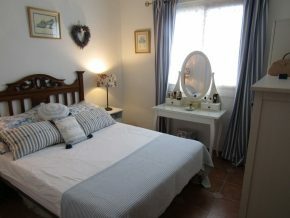 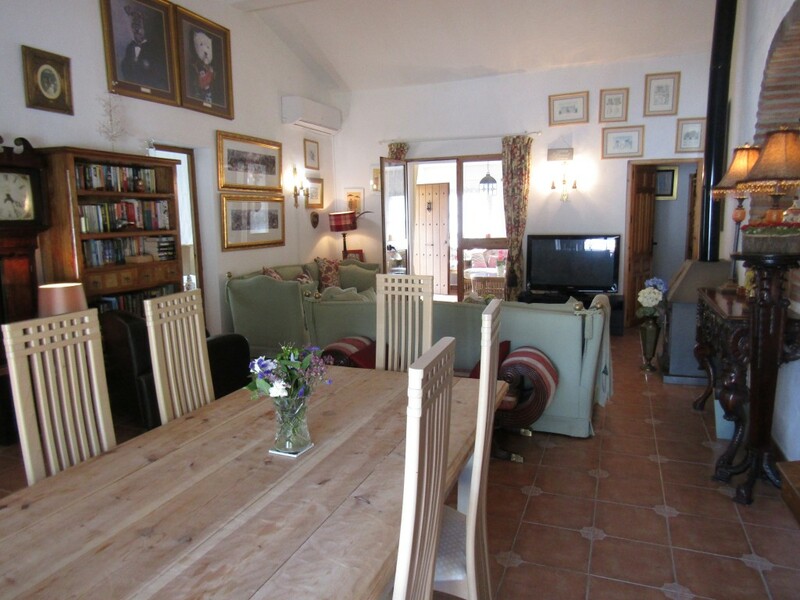 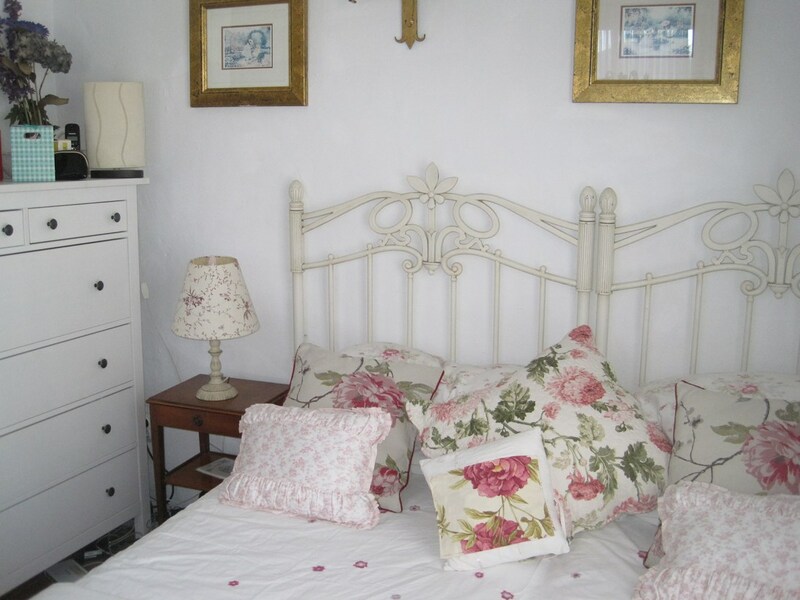 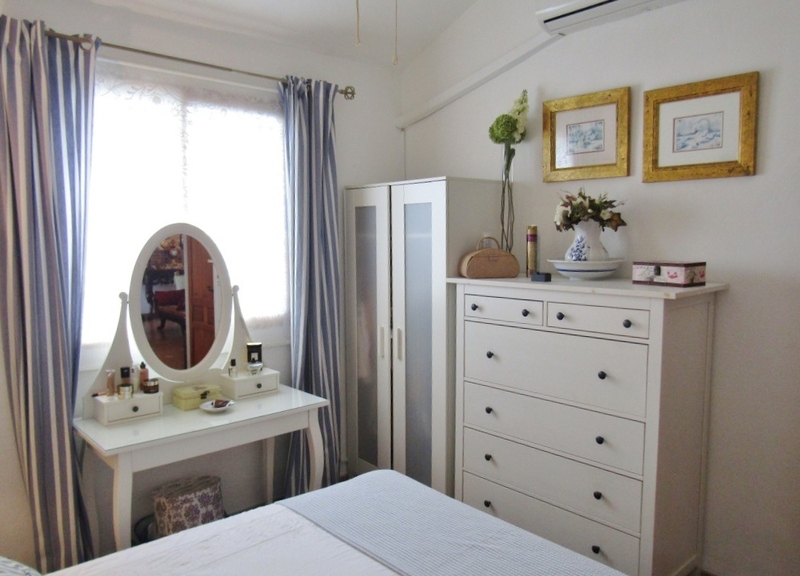 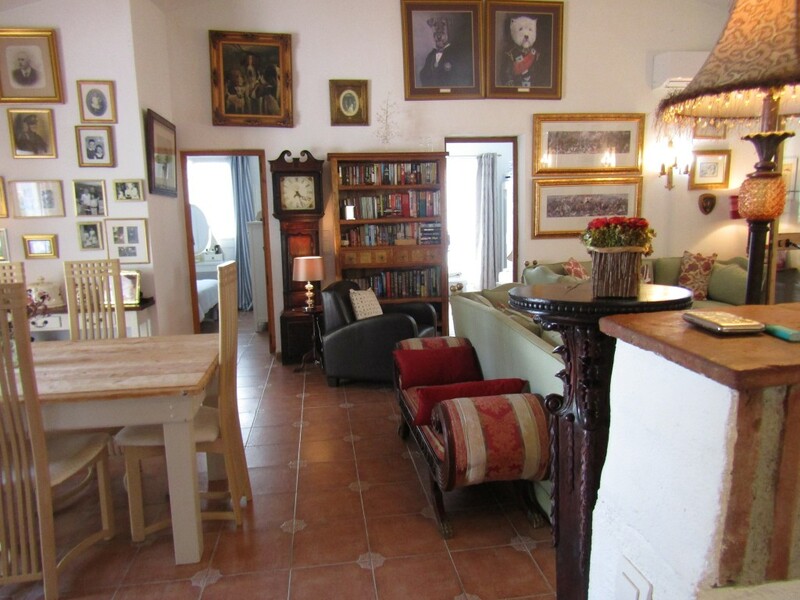 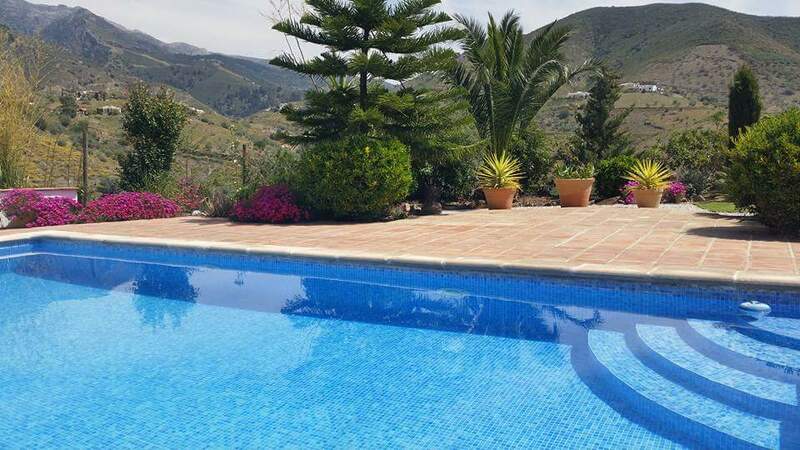 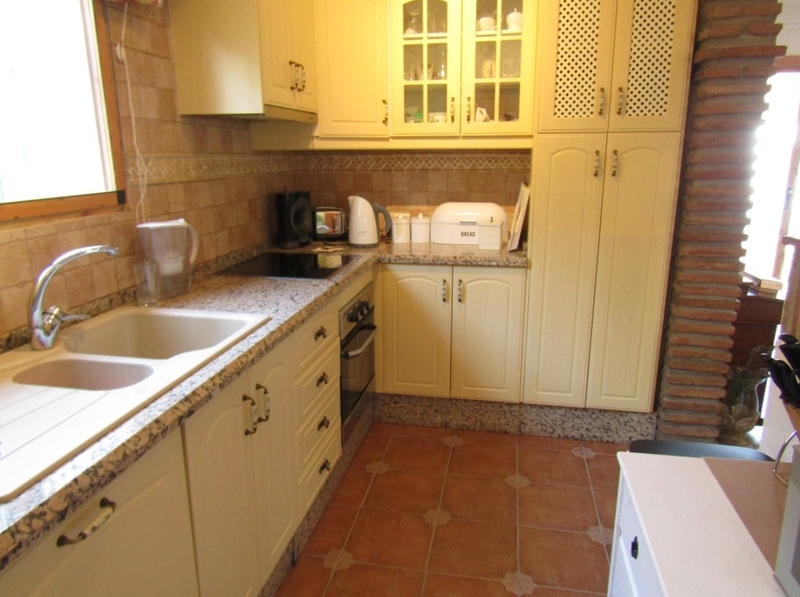 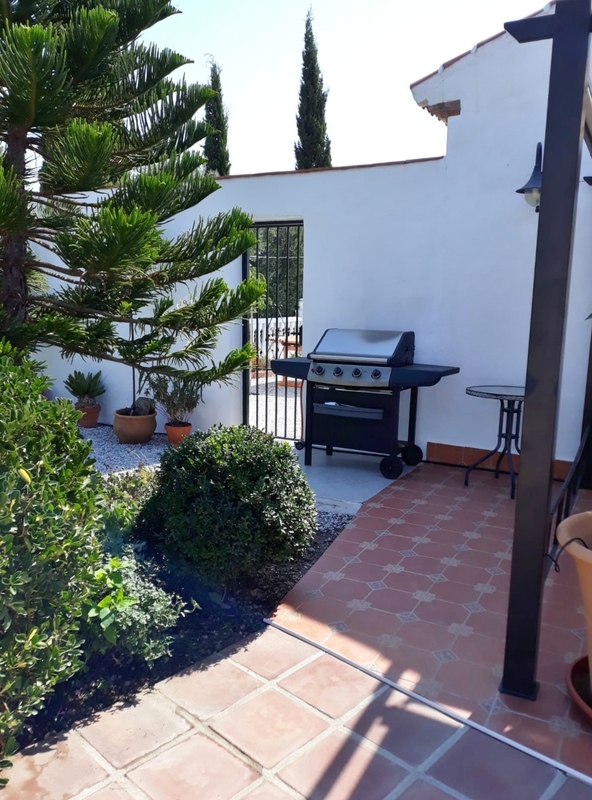 For three years the property has been let during the warmer months by the current owners very successfully and has a Tourist Registration Number. 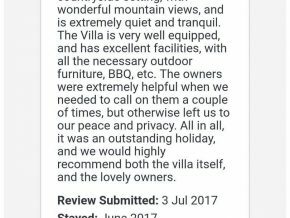 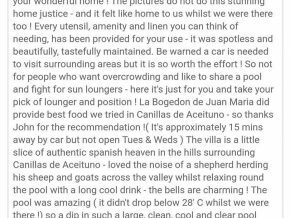 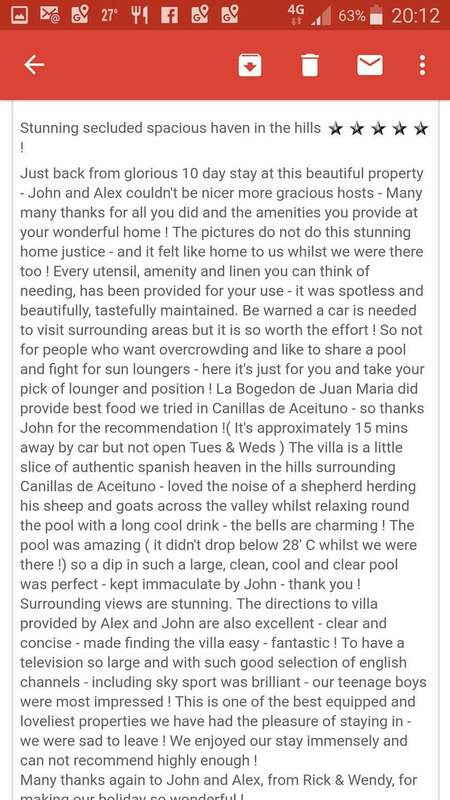 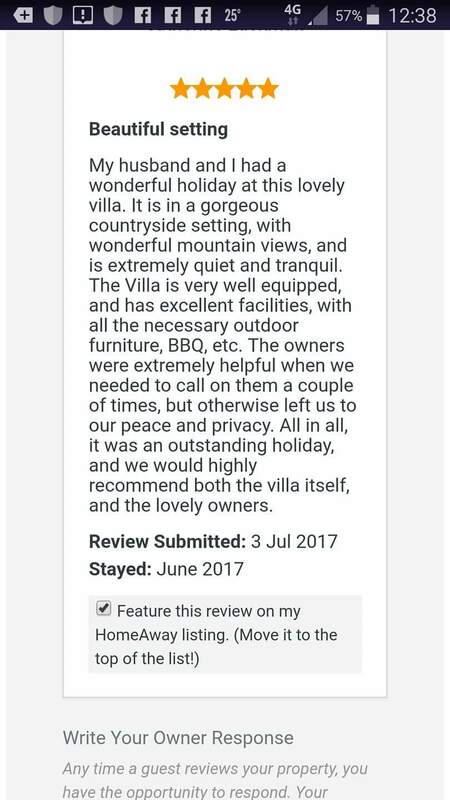 See cuttings from some recent guest reviews, below. 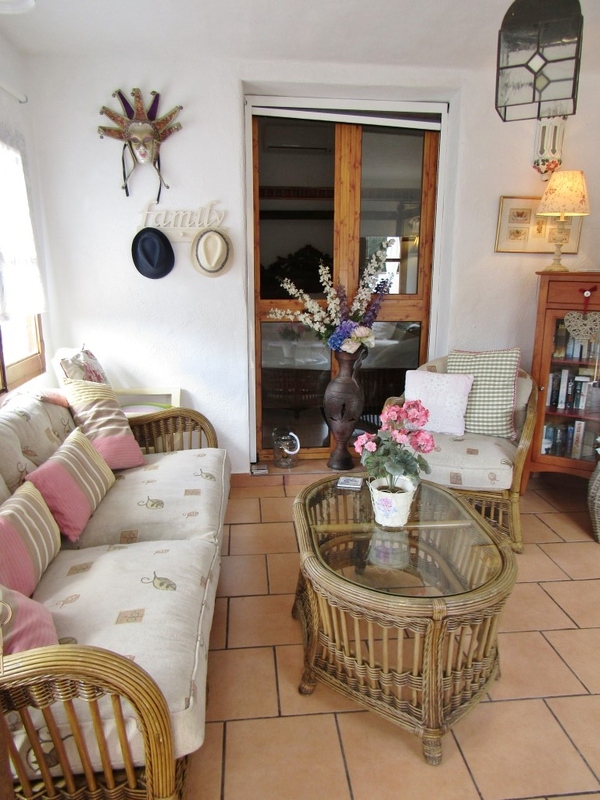 This delightful, quality home is being sold at a very good price and is mortgageable. 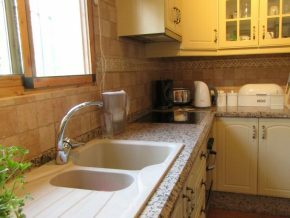 – Council tax (IBI): 430 Euros p.a.